When you think of engagement photos, you probably picture grinning couples in their 20s or 30s. The internet is full of them: happy young men and women poised to begin the second chapter of their lives together. But the engagement photo that's taking social media by storm this week isn't an image of young love — quite the opposite, actually. It features a pair of smitten senior citizens, holding a sign with three simple words, proving that it's never too late to fall madly in love. Seventy-year-old Cleveland "Murphy" Wilson and Lucinda Myers, who is in her 60s, admired each other from afar for three years at the Alabama church they both attend, before they started dating. Lucinda had heard she had a secret admirer and she tried her best to look "on point" for him every Saturday, but she wanted him to come to her, not the other way around. All that changed, however, when Wilson missed a few Saturdays and Lucinda felt his absence. Upon his return, she summoned the courage to approach him and say, "I haven't seen your beautiful smile lately." The pair started dating shortly after that and, one month later, he popped the question. Now, they're planning a wedding for July 29. Gianna Snell, who snapped the couple's now-viral engagement photo, says she recognized that their connection was special the moment she first laid eyes on them. 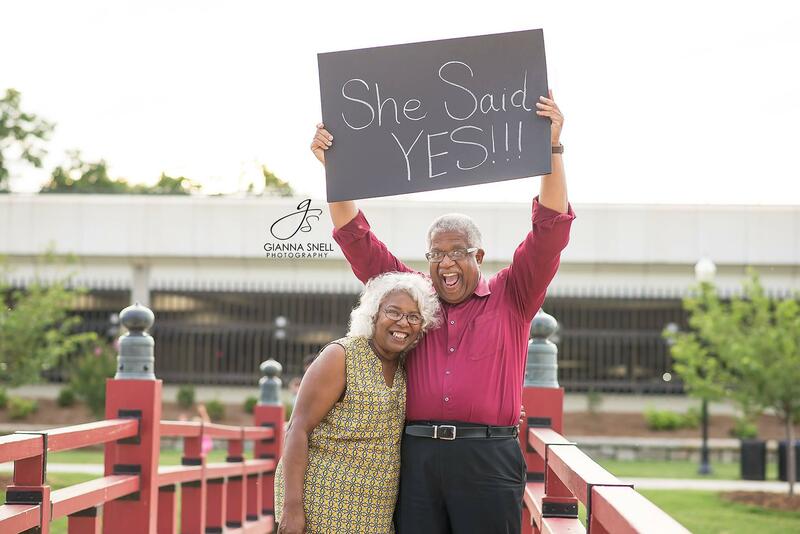 "It's not every day that you see senior citizens so excited and giddy about getting married," she wrote in a blog post after the photo session. "It's a bit out of the ordinary. That's why even on the day that I met this duo in the park to capture images for their engagement announcement, bystanders were drawn to them. There were teenage girls, families and young couples who stopped what they were doing to take in this rare glimpse of an older couple whose love was so new that they couldn't take their eyes off of each other." Snell tells CBS News she initially worried that the couple would be bashful about showing their affection in front of a crowd. "But once I was in their presence, I realized that in their eyes, there was no crowd there, only the two of them," the Alabama photographer recalls. "I saw the way she kept gazing up at him lovingly and she couldn't stop smiling. I noticed how he couldn't keep his hands off of her. There was just this sincerity about them that had me smiling and giggling the whole session." It wasn't the first time Murphy Wilson had found true love. He had been married to a beautiful woman named Antoinette Snodgrass for 41 years before she died in 2013. And after that, he wasn't sure the ache in his heart would ever heal. For months, he found it too painful to attend First Seventh-day Adventist Church, where he was the choir director and had gone with his beloved wife for decades. So, he stayed home on Saturdays instead. When asked if he'd ever remarry, he reportedly told friends that he placed all of his romantic faith in the Lord: "God picked her the first time I married. He's going to have to do it again." Lucinda Myers had also been married before. Hundreds of miles away in Boston (coincidentally Wilson's hometown as well) she had gotten divorced and spent 30 years as a single woman, praying that God would send her the right man. Then, in 2013, she moved to Huntsville, Alabama for a fresh start. So, the day Murphy Wilson returned to church, his future fiancé was sitting just a few pews away. Three years later, as photographer Gianna Snell prepared to meet the happy couple for their engagement photo shoot, she grabbed a black foam board and chalk on her way to the park. "I was considering writing the wedding date," she tells CBS News, "but as we got into the session and I saw their happiness and his genuine excitement, I knew that just writing the date would not really evoke any emotion from them or the potential viewers of the image." Snell chose instead to write the phrase, "She said yes!" And handing the board to her subjects, Snell told them to look excited. "Well, that's not hard," Wilson responded immediately. "I am excited! I'm here with this gorgeous woman!" "As soon as he held up the sign, the people that were surrounding them in the park, feeding ducks or hanging out, began to clap and cheer," recalls Snell of the memorable moment. "It shows us that new love is not just for the the young... that it's never too late to believe that you will smile again, dance again, love again." Lucinda — or Cindy, as her finacé affectionately calls her — isn't on social media. So she didn't know that the photo had gotten more than 33,000 likes on Instagram, until her grandson was scrolling through his feed one day and saw it. Later, Wilson's youngest daughter, Danita, sat the couple down to explain that their photo had gone viral. "Viral?" the pair responded. "What does that mean?"